One of the best ways you can make sure that you have a ‘good hair day’ every day is to use certain natural oils for your hair. These oils contain all the nutrients, minerals and fatty acids that your hair and scalp need to be healthy and as a bonus, some of these oils can also encourage hair growth for men and women alike. 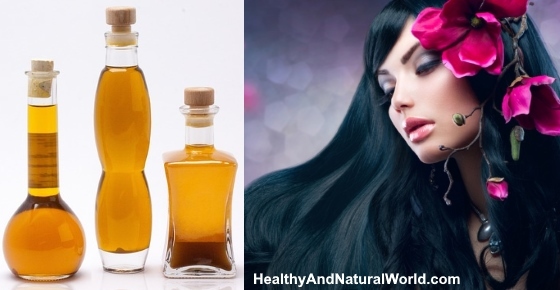 Another great benefit is that by using oils on your hair and scalp, you avoid many of the dangerous chemicals which can be found in expensive hair-care products. The oils should be at room temperature, or warmed slightly. Gently massage the oil at the hair roots and work down to the tips. Wrap your hair in a towel or shower cap and leave for at least 30 minutes before washing it out. If you want an effective hair conditioner which provides deep moisturization, then extra virgin olive oil is a great choice. Olive oil also contains antioxidants and has many health benefits which I’ve outlined in my previous article. Apply about 2 tablespoons of olive oil as a hair mask after washing and conditioning your hair. Depending on your hair damage, you should wait for at least 30 minutes before washing it out. It can be left on overnight. It can also be applied to dry and damaged hair. Massage some olive oil into dry hair and wrap your hair in a warm towel. Leave for at least 30 minutes then wash as usual. For more ideas, read my article about the most ingenious uses of olive oil for hair. Virgin coconut oil is one of the best oils for hair and is great for moisturizing hair and treating damaged hair. One study showed that the structure of coconut oil allows it to penetrate into the hair shaft and reduce protein loss1. Coconut oil is effective in reducing hair loss, providing deep conditioning, treating dandruff, and protecting from sun damage. To find out more about how you can use coconut oil to nourish your hair, you can read my article about 8 ingenious ways to use coconut oil on your hair. You can use coconut oil both as a pre-wash treatment (as outlined above and warming the oil to room temperature) or a very small amount can be massaged into the hair after washing, to help moisturize frizzy hair. When used as a hair mask, castor oil is an effective natural oil for moisturizing the hair, treating dandruff, and encouraging hair growth. It contains nutrients and minerals which are essential for healthy hair. It also contains vitamin E and omega-6 fatty acids. To use castor oil for hair growth, you should apply it as a hair mask 2 to 4 times a week. Castor oil has a thick consistency, so you can mix it with other natural oils in a half and half ratio. You can get the full details in my article on how castor oil can improve and regrow your hair. If you want to use it as a conditioner and for general hair care, massage a pea-size amount of castor oil into your scalp after washing. According to Ayurveda, castor oil can be used to reverse gray hair. For gray hair treatment, make a hair mask from 1 tbsp mustard seed oil, 2 tbsp jojoba oil and 2 tbsp castor oil. Argan oil is one of the most effective natural oils for hair, but it is also one of the most expensive. It works wonders on hair because it is rich in antioxidants, vitamin E and omega 3, 6, and 9 fatty acids. Always make sure to buy 100% pure Argan oil and not an Argan oil blend, which may only have a small amount of the oil. You can read more about the uses of Argan oil in my article on how to use Argan oil for great hair and skin. It is best apply argan oil to damp hair and you should massage it into the scalp. To prevent split ends, you can just rub a small amount on the dry ends. Jojoba oil treatment for hair can help with hair loss by strengthening and protecting the growth of new hair. Its anti-inflammatory properties also help treat itchy scalp and scalp psoriasis2. Jojoba oil also contains zinc and selenium, which are important ingredients in treating dandruff. It will help your hair to look smooth and silky. Use jojoba oil as a hair mask either before or after washing hair to reduce frizz and moisturize your hair. Avocado oil has many benefits when it comes to skin care. However, it is also good for hair care because avocado oil is rich in vitamin E, which is essential for maintaining healthy hair3. It is also a good source of monounsaturated fats which provide hair follicles with the nutrients they need to stimulate hair growth. You can apply avocado oil as a hair mask to repair heat-damaged hair, prevent split ends and strengthen hair. You can also add some to your favorite conditioner for great regular hair care. The advantage of massaging avocado oil into your scalp is that it is very light and absorbs easily. Sweet almond oil contains numerous healthy ingredients to nourish the skin and hair. It is also a good source of vitamin E, omega-3, zinc, and magnesium. By regularly using it as an oil treatment for hair, you can help promote hair growth and shiny hair. Almond oil can be combined with other oils for hair like jojoba oil and essential oils. It is also effective in controlling dandruff and reducing scalp inflammation. To have shiny, healthy hair, use almond oil as a hair mask once or twice a week. If you need to repair and prevent split ends, then mix equal amounts of castor, olive, and almond oil and then massage into your hair once or twice a week. If you suffer from fine or thinning hair, then pomegranate seed oil can help to stimulate hair growth and give you shiny, great looking hair. The oil contains rare omega-5 fatty acid which is a powerful antioxidant. Studies show that it has a beneficial effect on the skin4. It also effective at unclogging hair follicles. Because it is quite thick, it can be mixed with other hair oils to provide great hair care. This natural oil is excellent when used in a hair mask. You can also use it in a hot oil treatment to reduce frizzy and tame curly hair. Alternatively, you can put a few drops of pomegranate seed oil on your palms and massage it into your hair. If you use straightening irons, then use it as a serum to protect your hair from heat damage. I have written previously about the health benefits of eating pumpkins seeds. However, research on pumpkin oil has shown this to be an effective natural remedy for hair loss5. The oil contains many antioxidant properties and can protect the skin and scalp from free radicals. You can either consume the pumpkin oil itself or around 1.5 tablespoons of shelled pumpkin seeds which is equivalent to 400 mg PSO. Amla, or gooseberry oil, is not actually an oil in itself, but a fusion of gooseberries and a carrier oil like castor, sesame, or almond oil. It combines the beneficial fatty acids from the oil with the nutrients of gooseberries to help treat itchy scalp conditions and strengthen the hair follicles. In fact, studies on amla oil have shown it to increase the number of hair follicles6. Amla oil can be used as a hair mask before washing. You should massage some oil into your scalp, and then wrap your hair in a warm towel. It can also be left in overnight. To use alma oil as a conditioner, massage a small amount into your hair after shampooing. It is best used only at home or during the night because of its musky smell. For more ideas, read my article about the best uses of amla oil for hair. Vitamin E is one of the most important nutrients for hair care, and can greatly benefit greatly your skin, hair and health. Vitamin E oil can help condition the hair from root to shaft, making it shinier as well as treating split ends. Vitamin E can be applied to the hair topically in the form of oil or the liquid from vitamin E capsules. Mix together the contents of two vitamin E capsules with two tablespoons of oil, such as warm coconut or olive oil. Then massage the mixture into the scalp and let it sit for 30 minutes. Wash out the mixture as usual. This can be repeated once or twice per week. In addition to the oils I have just mentioned, there are many essential oils which can be added to carrier oils or straight to your shampoo bottle to give your hair a boost. I’ve covered some of them in my previous article about how to use essential oils for healthy hair and in my e-book Magical Aromatherapy. Studies have shown that rosemary essential oil boosted hair growth in men who were showing signs of male-pattern baldness7. But this hair oil is not just for men as many women also experience hair thinning and loss. Rosemary oil can be added to your regular hair care routine by adding rosemary oil to your shampoo or conditioner bottle (use about 10 – 12 drops for every ounce). Or, to massage it into your scalp, add 3-4 drops of rosemary oil to a tablespoon of jojoba oil or sweet almond oil. Leave it for at least 30 minutes before washing out. Clinical research has also established that peppermint oil is beneficial for hair growth and it can work more effectively than Minoxidil, which is a popular drug to promote hair growth and combat baldness8. You can use peppermint oil together with rosemary oil for even better results. For your daily hair care routine, add peppermint oil to your shampoo (since peppermint oil is very potent, use 4 – 6 drops for every ounce). Alternatively, add 2 drops to a tablespoon of jojoba, almond, or coconut oil and massage into your scalp. Leave for 30 minutes and wash your hair. Tea tree essential oil is well-known for its antibacterial and anti-fungal properties9. Therefore, it can help treat dandruff and itchy scalps. It also unclogs follicles, which in turn assists in hair growth. To use tea tree oil to maintain healthy hair, add a few drops to your favorite shampoo. Rub the tea tree oil shampoo into your scalp and let sit for 5 minutes. Then rinse with water. In fact, a 2015 study found that the application of lemongrass oil reduced dandruff significantly after seven days and increased the effect even more after 14 days of topical application. Essential oils for hair can help to boost the health of your hair in several ways, whether you want to thicken your hair, add shine, hydrate your scalp, treat dandruff or lighten your hair naturally.